After a 14 hour flight from Frankfurt to Buenos Aires (not including the previous travel time from Berlin to Frankfurt,) arriving in Buenos Aires only to discover they do actually now charge American citizens a “reciprocity tax” of $160 dollars (i.e. a “visa” to enter the country,) and an hour drive to my apartment from the airport, I was exhausted. I debated never leaving the apartment, ever, and just staying put to sleep away the day. But then I remembered, I was in Buenos Aires! So I ingested some caffeine (Excedrin people, nothing strange here!) to knock out my headache, put on a new, cute summer dress I acquired in Berlin, and hit the streets. The minute I stepped outside into the sunshine and busy streets of BsAs (Buenos Aires), I couldn’t hold back my smile. I felt like skipping along the roads and shouting that I had made it! For a girl who loves to shop and doesn’t often get to do it (it’s a non-profit world I’m in these days,) Buenos Aires is heaven. Fashion and style abound, and for the less noble (like myself) the leather is simply gorgeous. You cannot hold back from drooling over purses, shoes, and jackets galore. So to me, a perfect day in Buenos Aires consists of wandering the streets of Palermo, popping into shops to my heart’s content, stopping for a mid-morning espresso or fresh squeezed juice, wandering some more, and finding a delicious place to hole away for mealtime. That is one thing there is absolutely no shortage of in BsAs – food! And it is the best you could possibly imagine. Fresh ingredients, crisp salads, delicious pastries, mouth watering steaks – and not to mention the more exotic choices which have found their way into BsAs kitchens such as Japanese or Moroccan. I managed to find my way into a few new restaurants that have popped up in the last few years since I was here. 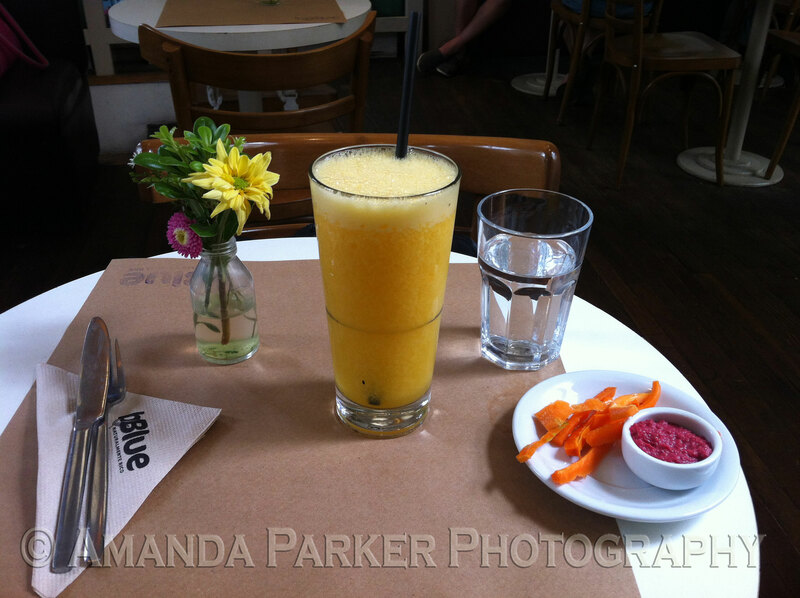 On my first day I was lucky enough to stumble upon B-Blue Deli & Natural Bar where I delightfully realized my mango juice would be served my favorite way – freshly squeezed and oversized! Accompanied by a side of carrots and some healthy dip I couldn’t quite identify, but was delicious all the same. Knowing I was in for a few weeks of eating meat almost exclusively, (Paraguay does not have quite as prevalent a vegetable market in local restaurants as one would think given their extensive agriculture,) I eagerly ordered a salad. And once again, I was wide eyed at the largess of the bowl put in front of me. After two years living in Germany, I have yet to find a place that does salads right by me, and by right, of course, I mean like this! 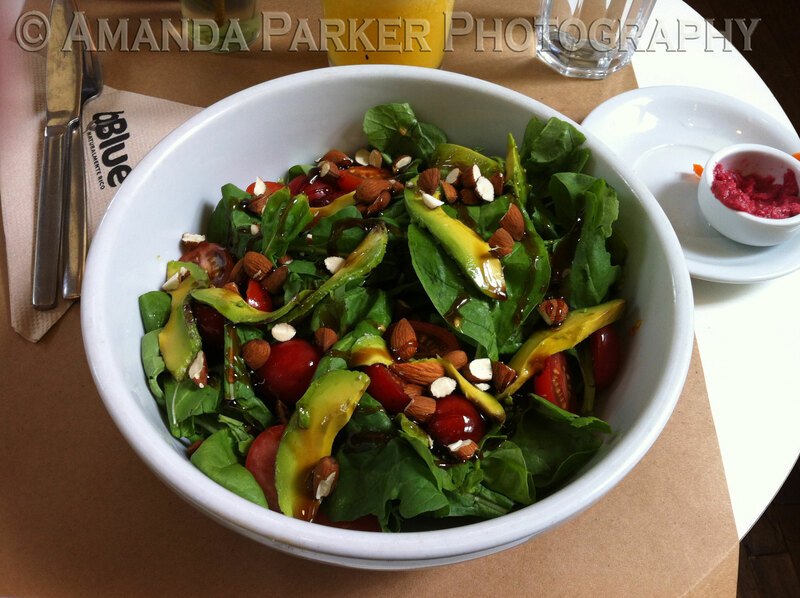 Mixed greens, avocados, almonds, tomatoes, and some type of honey vinaigrette – muah! Perfection. Knowing I had plenty of steak ahead to fill my days and nights, I relished this fresh and healthy delight, (and took note of the ingredients with a promise to replicate the same at home!) And this was the beginning of my quest for yummy delights throughout the city. Warmth, sunshine, and delicious food – indeed I had arrive in my beloved BsAs!